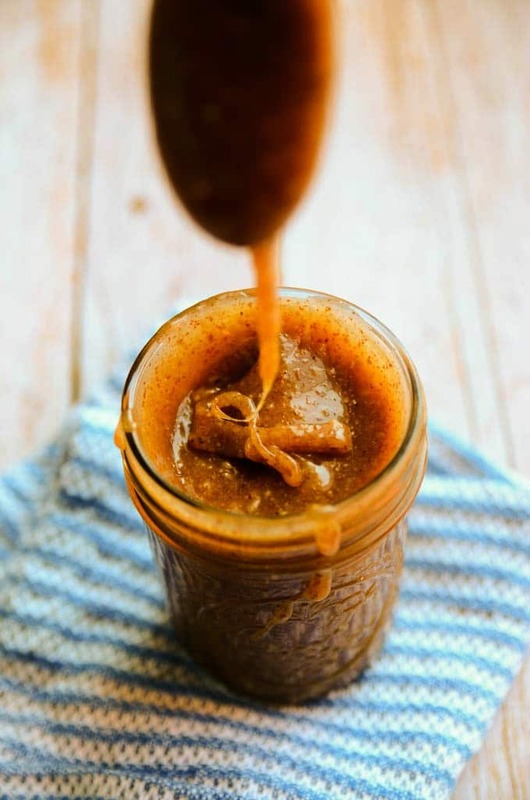 This five minute vegan caramel is made with five simple ingredients and truly comes together in no more than five minutes. Pure maple syrup, creamy almond butter, coconut oil, vanilla extract, and a pinch of salt are poured into a sauce pan and whisked together as they warm. The ingredients combine effortlessly and take on all of those beloved caramel qualities: drizzle-worthy, sticky, sweet, and buttery. I have to be honest; I had no intentions whatsoever of creating a caramel recipe over the weekend. And yet, while working on a granola recipe this past Saturday, I noticed that the mixture of ingredients I planned to coat the granola in was wafting this amazingly sweet, rich, and buttery smell as it warmed on the stove. As soon as I caught its scent, I abandoned the oats and buckwheat I had been measuring out and rushed over to check on it. I tasted it, did a happy dance in our kitchen, and then ran down the hall to wake Dan up in hopes that he might confirm the same thoughts I had about this delightful mixture: it tasted exactly like caramel! He confirmed my caramel hopes and then requested another few tastes. Nothing like some sweet spoonfuls of caramel to start your Saturday off right. I still ended up using the mixture to coat the granola in, and it worked perfectly for its originally-intended purpose. However, quickly after finishing the granola recipe, I remade the mixture so that I could double-check the measurements and confirm that the first time wasn’t some sort of caramel-coated anomaly. It wasn’t. It really is amazing! This caramel is made with five simple ingredients and comes together in no more than five minutes. Pure maple syrup, creamy raw almond butter, coconut oil, vanilla extract, and a pinch of salt are poured into a sauce pan and whisked together as they warm. The ingredients combine effortlessly to become everything it is that we love about caramel: drizzle-worthy, sticky, sweet, and buttery. 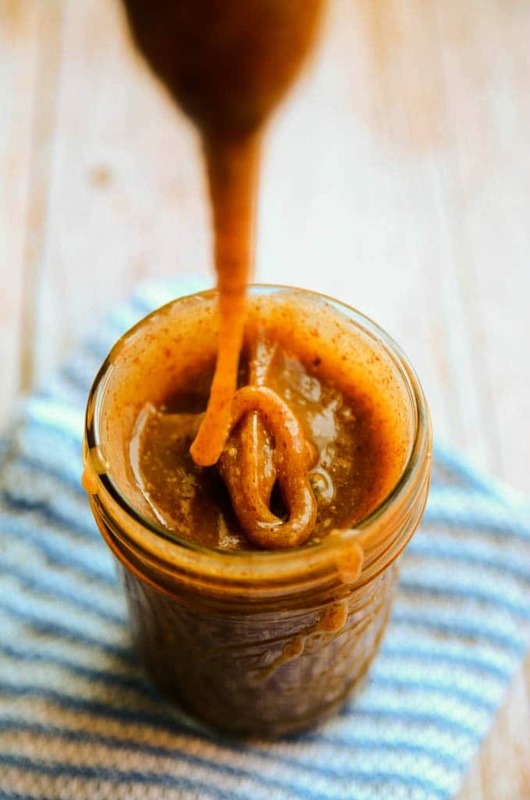 As it cools to room temperature, it thickens up even more (the photos were taken after letting the mixture sit at room temperature for about 15 minutes), and after refrigerating it you’ll have a super-thick, scoopable caramel that can be enjoyed as is or warmed back to a drizzly state. I have all sorts of ideas for ways to incorporate this caramel into a variety of dessert recipes, but it was just too good not to share with you now! 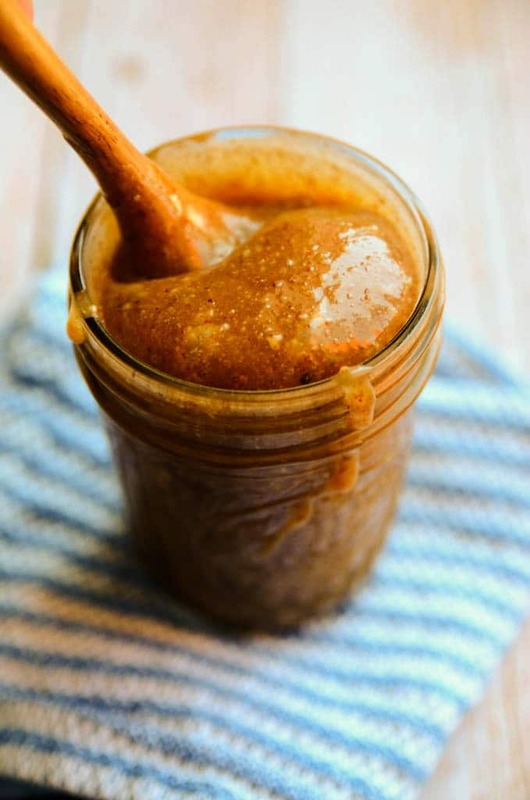 And, really, caramel doesn’t need much dressing up or fancy layering to be enjoyed. We drizzled it over apples and scooped it directly from the jar, and it was the perfect sweet snack. I hope you find this simple caramel to be as spot-on as we did. 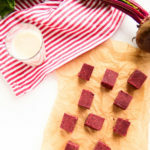 This recipe has already earned a place close to my heart! Add all ingredients to a small saucepan. Whisk together over medium low heat until all ingredients are melted together (approximately 3 minutes). Remove from heat and let cool to room temperature. Enjoy over ice cream, apples, or all on its own. Refrigerate leftovers. As the caramel cools, it becomes even thicker. Reheat in a sauce pan or enjoy as is! 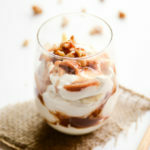 If you want a super creamy and smooth caramel, you can transfer the warm caramel sauce to a blender and blend on high. The caramel in the photos was left as is and not blended, so it's already quite smooth as is! I’m so glad you loved it! 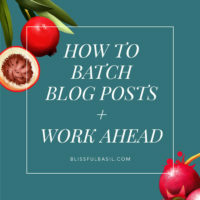 Thanks so much for linking back within your post. I’ll definitely have to try it with peanut butter! I might sub out the maple syrup for pureed dates. Not because I don’t like Maple (love it) just don’t have any right now…and I really ‘need’ to eat your Vegan Caramel Crumble Bars a.s.a.p.! 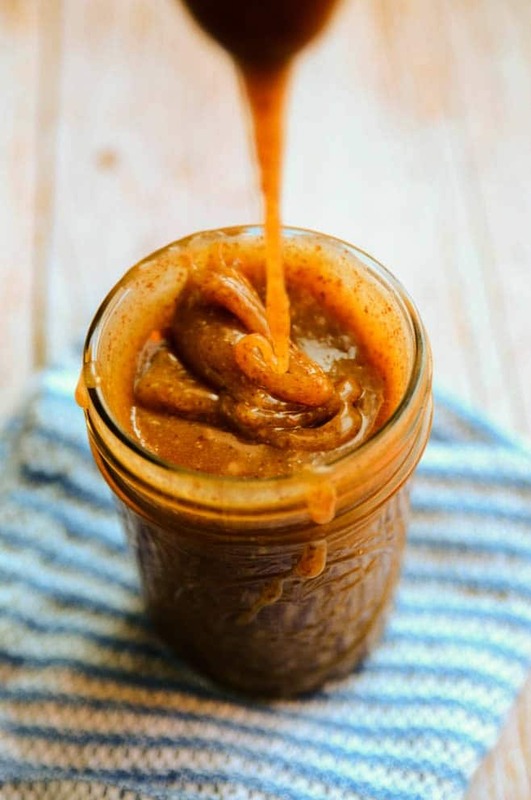 I love almond butter caramel, I make it all the time (minus the oil) and recently I saw somebody do it with peanut butter, Yum. My favorite way is with coconut butter, it really does taste like caramel since coconut butter is so buttery. That is probably my favorite way to eat it. I’m not a fan of the popular date caramel unfortunately. 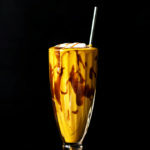 I love your last drippy caramel photo, delish!! Thank you!! I agree about the date caramel. It’s okay but no replacement for that real, drizzly, buttery caramel! Sometimes the best things happen by accident! The caramel looks delish — I’d be doing a happy dance too! I’m looking forward to the blueberry granola recipe, too. My hubby loved this. Especially since it was dairy free and tasted so delicious!! Thanks!! Does this need to be kept refrigerated? I’ve made it a few times (IT’S AMAZING) and just kept it out on the counter, and it seems fine. Is this ok? Hi Lacy! I’m so sorry for the delay! I keep it refrigerated because some of the ingredients that go into it (i.e., maple syrup and almond butter) need to be refrigerated on their own, but I’ve heard others say that they haven’t refrigerated it. 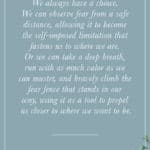 I tend to err on the safe side when in doubt! Refrigerated or not, I’m so glad that you’re enjoying the recipe so much. It’s one of my favorites! Hi, Roxanne! 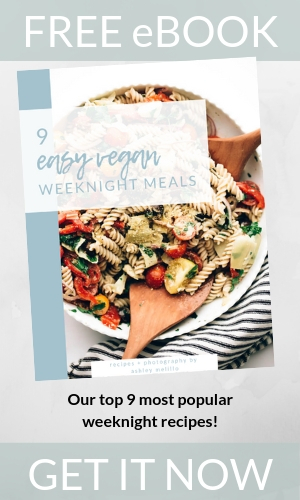 It will depend on what type/brand of each ingredient you use, but I usually store mine in the refrigerator for up to two weeks (if it even sticks around that long) without any problems. I hope this helps! 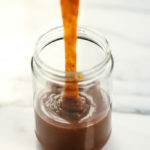 I had some of this left over from making the chocolate&caramel slices and brought it to my in-laws in a jar. They tried some over a rice pudding and loved it! And I can’t stop sneaking little spoonfuls in my mouth, this is really the best invention ever. Omnomnom! Haha, I love that you were sneaking spoonfuls, because I do the exact same thing whenever I make this recipe! I’m so glad you enjoyed it so much, Terje! I didn’t have maple syrup left so I made this using raw blue agave. It turned out amazing. I knew it would taste great, but I was totally stunned by the texture, it’s perfect. Thank you so much! Hi Kayla! I’m so glad that you enjoyed the caramel! I’m happy to hear it turned out well with agave, as I hadn’t tried that substitution yet. Thanks for taking the time to report back with your results! Just made it with peanut butter, eyeballed measurements. This. Changes. Everything. Can’t wait to try with different nut butters. Salty sweet caramelly. I’m in love. I love this comment, Audrey! This caramel changed everything for me too! It still lives on as one of the happiest accidents in my kitchen, and it works with every nut and seed butter I’ve tried thus far. 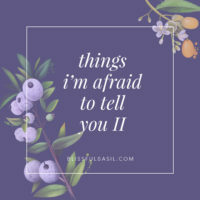 I’m so glad that you’re enjoying it, and thanks so much for taking the time to share your results and adjustments. 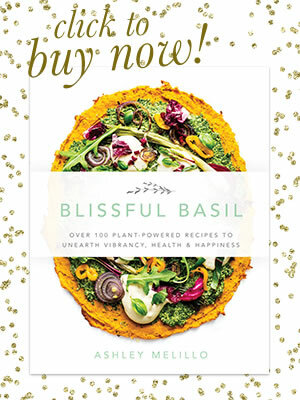 I used this sauce for a topping on my vegan yellow cake. My husband is from Georgia and his favorite cake is Caramel Cake. We haven’t had it in many years since I turned vegan 4 years ago. Haven’t eaten it yet but it looks delicious. Hi, Colleen! I hope it worked out well on the vegan yellow cake; that combination sounds seriously delicious. Hi, Magda! So happy to hear you’re enjoying the caramel so much. I often eat it straight from the pan too; it’s extra delicious when it’s warm! I just made this unfortunately without the vanilla because I didn’t have this at home and it was amazing!!! Possibly a new food obsession lol. Thank you for sharing this wonderful recipe! I taught a nutrition class to preschoolers where we paired different types of apples with your sauce and dipped them into various toppings (coconut flakes, graham crackers, pumpkin seeds, etc.). It was a great success and a number of the staff asked for this recipe! This is definitely one I’ll make again! Overall good recipe, but the coconut taste was too strong for me to really say it tastes like caramel. I even added additional maple syrup and vanilla to try to balance it but it didn’t do enough. The texture is great though, and it is still a great sweet condiment for snacks. I just not caramel tasting enough for me. Maybe if it was a refined coconut oil instead of virgin coconut oil? Any other suggestions? I did it with peanut butter and instead of coconut oil used vegan butter, cuz in my opinion it gives a strong coconut taste which i didn’t really want in caramel and it came out delicious! Thank you! Excited to try doing it with different nut butters! Hi, I was interested in making this recipe. I want to add it into an ice cream as I am experimenting with making dairy free flavours. Will this freeze well inside an ice cream mixture or is it meant to be a sauce? Hi, Felicia! 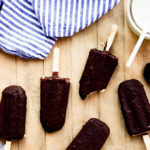 I’ve never tried swirling it into ice cream to freeze, but it does freeze well when drizzled! It will set and firm up in the freezer as opposed to staying sauce-like. I hope this helps! Hi, Em! Oh no, I am so sorry you’re having trouble with it, and especially since you used expensive maple syrup. What type of nut butter did you use? Peanut butter? Or another type? Was it natural nut butter (i.e., simply made of ground nuts with maybe a bit of salt but not additional additives such as palm oil or others)? 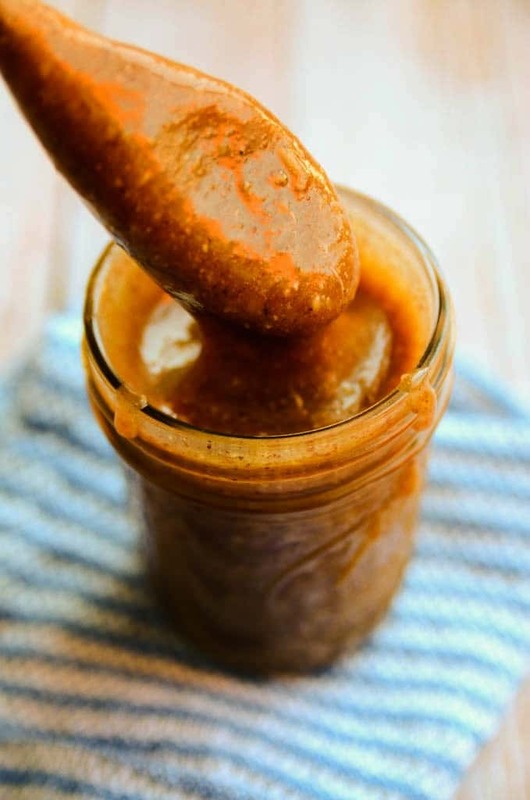 Although most of the more processed nut butters do work in this recipe, it’s possible that if there were several additives or different types of oil that it could have caused it to separate. But I’m slightly stumped, because I’ve made this recipe more times than I can count as have others, and I’ve never had this issue. If all other ingredients were the same, I have a feeling it was the specific type of nut butter you used. Did you happen to take photos? I might have a better idea what’s going on if I see it. The same thing happened to me when I decided to blend the mixture into something creamier with the blender. I used homemade almond butter and I believe the introduction of water via syrup and vanilla extract caused the oils present in the nut butter to seize up. After a bit of experimentation (I really didn’t want to waste all that delicious maple syrup and coconut oil) I found that if I added about a tablespoon or two of really, really hot almond milk into the blender with the caramel tasting blob and after 20-30 seconds, I got a creamy caramel. I imagine this might work with really hot water, be careful though. Hope this helps anyone else who might encounter this kind of problem. Super yummy though! This turned out excellent in its own right! However, it wasn’t exactly like caramel. I eyeballed the measurements and it was nuttier- I could taste the almond butter. Is that how it is normally? I also did not heat it and just added everything to my vitamix and blended. The consistency was on point and we loved the taste too. Just not exactly like caramel! OMG! You’ve done it! 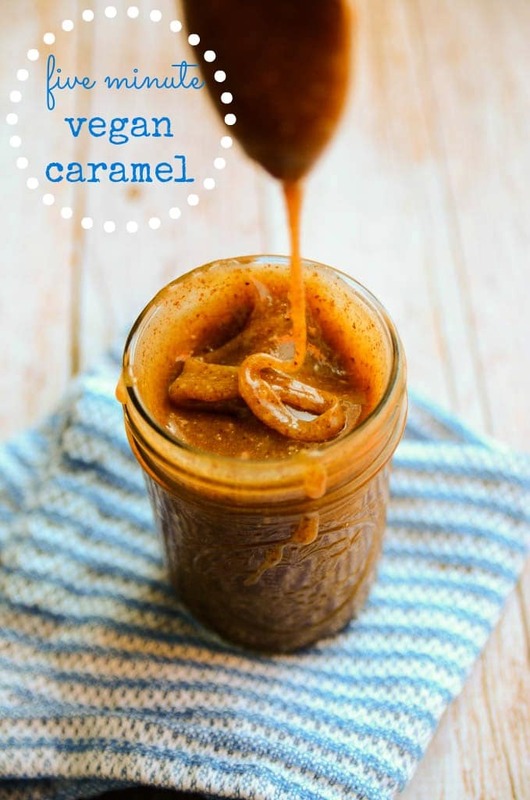 :) This vegan caramel is super-dee-duper delicious! Absolutely amazing and delightful! I followed the recipe exactly and it came out perfect. It’s tastes just like buttered caramel. I dipped apple slices and toasted pecans in mines. I made my own almond butter. I also blended mines after the 3 minute cooking. It was so creamy and good. My daughter and I enjoyed this. Yes, even better than the date and peanut butter caramel (though I can appreciate that kind). So THANK YOU so much for sharing! Another great treat! 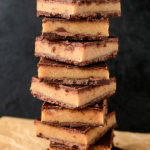 I just made this with my daughter and used chunky peanut butter and it was soon delicious, I could eat the entire batch from the pot! Yum! And it tasted just like caramel. Oh My GOSH!!! 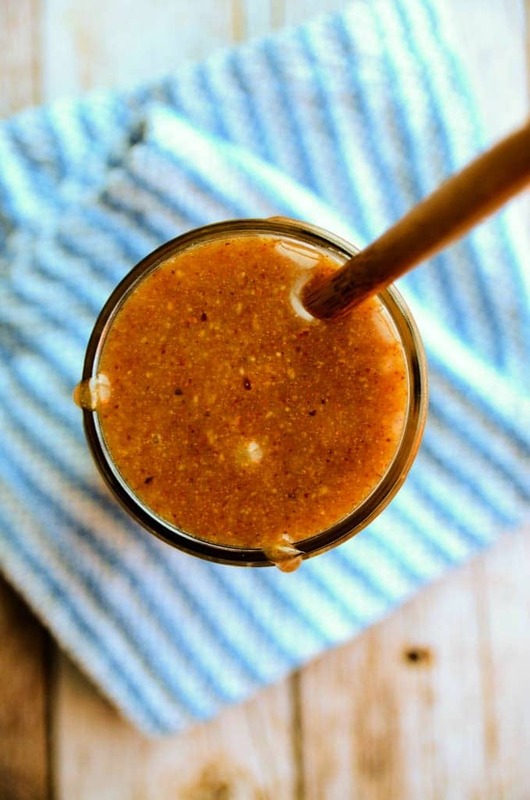 I just found your blog, maybe an hour ago, and I’ve already made the Vegan Caramel Sauce. Total, complete, bliss. Absolutely delish! I filled one small mason jar, and had about a quarter of another jar left. Only the full jar made it into the refrigerator. My stomach is very happy at the moment. Thank you!!! Thank you for the recipe, can’t wait to try it too! By the way, do you know for how long it can last in the fridge? Thank you Ashley! I will post the results! This is brilliant! So glad to find a caramel recipe that doesn’t use dates!! OMG! 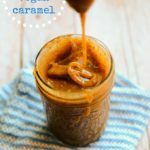 I tried making another vegan caramel recipe last weekend and it was a disaster. This is way easier and came out amazing. It took all the restraint I had to not siphon the whole thing directly into my face. I rarely leave comments, but this recipe was fan-freaking-tastic! Thank you so much for sharing!! Only change I made was to eliminate the vanilla as I have a sensitivity to it, and still had great authentic caramel flavor and super delicious. Geri! Thanks for taking the time to come back and leave a comment. Means so much, and I’m thrilled you’re enjoying the caramel sauce. Great to know that it works well without the vanilla too! So happy to hear you enjoyed the caramel, Eva! Thanks for taking the time to come back and share your thoughts—means so much! Sarah, this is the kind of feedback that keeps the creative juices flowing! Happy to hear you’re enjoying the recipes, and thank you for taking the time to come back and share your thoughts. Means so much! Can you make caramel apples with this? I mean I’m sure you could but would it stick and harden like caramel? Very yummy Ashley, thanks! I did not have almond butter, so I used hazelnut instead and I think it made it even more delicious. Thanks! 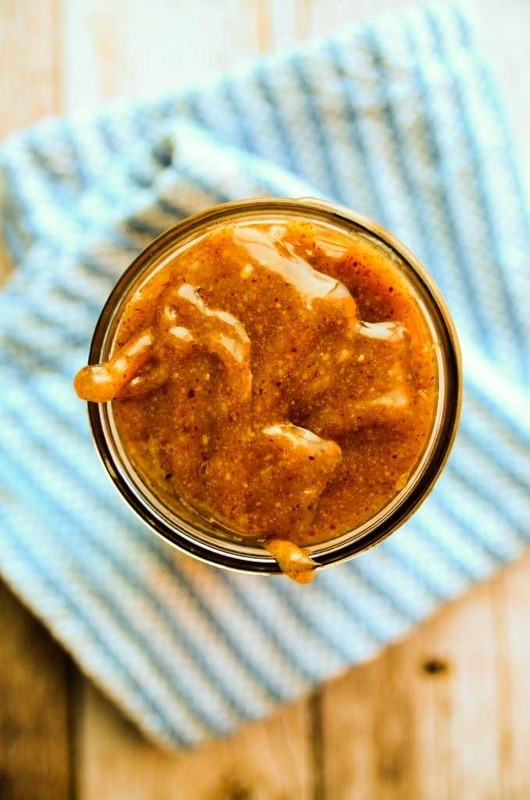 Ooh, hazelnut butter sounds like an excellent substitution! Thanks for taking time out of your day to come back and share your thoughts and rating—means so much.